This CM System is designed for precision cleaning a wide range of cast iron components to meet a stringent CAT cleanliness specification. To achieve this goal the system had to adequately, easily, and consistently remove manufacturing residuals contaminants from exterior surfaces and interior recessed areas (including blind holes). 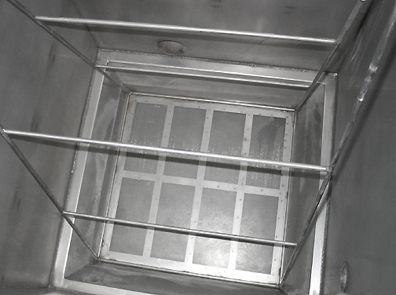 The process required a combination of high volume turbo/agitation/flushing, chip removal, oil removal, comprehensive stepped-down filtration, precision cleaning with ultrasonics, rinsing, and final rust prevention coating. A variety of sizes and configurations had to be accommodated using a universal work carrier. The process sequenced a line consisting of PreWash, Ultrasonics Wash, Final Wash, Hot Water Rinse, and Final RP Rinse Stations. All stages are constructed of heavy gauge type 304 stainless steel and designed for 1000 pound loads. 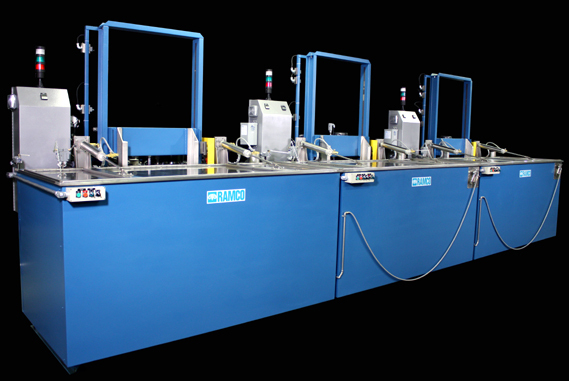 The PreWash and Precision Wash stages (shown above) are gas heated using blast burners and rear wall mounted serpentine heating coils. Both stages include high volume turbo systems. The PreWash provides over 200 GPM and incorporates a powerful turbo filter system with strategically located turbo jets, an inline chip removal system using welded piping with a pull-out basket, dual filtration with pressure differential monitor, and remote oil removal system. 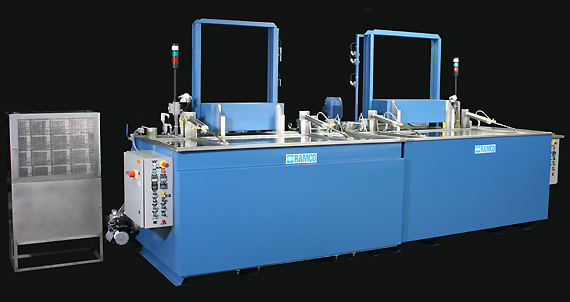 The Precision Wash also provides high GPM and incorporates a powerful turbo filter system with strategically located turbo jets, a very powerful ultrasonic cleaning system sequenced with Multiple Rollovers, and dual filtration with pressure differential monitor. 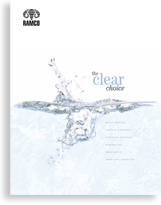 The unique RAMCO ultrasonic cleaning system cascades powerful sweep frequency (between 38 to 42 kHz) ultrasonics with agitation/turbo/flushing/washing. Using mechanical agitation washing to remove gross contamination and ultrasonic cleaning to remove finer and/or more resistive deposits is a very effective processing routine. The steps are sequenced with digital timers for agitation/turbo/flushing/washing before after the ultrasonic phase. And using our MultipleRollover feature the dual mode process can be repeated for any number of preset “rollovers”. The results are faster cleaning and more effective overall processing. The PreWash and Rinse stages (shown below) are electrically heated using high efficiency immersion heaters. All stages include high volume turbo systems. The Final Wash incorporates turbo filter with strategically located turbo jets and filtration with pressure differential monitor. The Rinse Stage incorporates turbo filter with strategically located turbo jets and filtration with pressure differential monitor. The Final RP Rinse Stage incorporates turbo filter with strategically located turbo jets and filtration with pressure differential monitor. All stages use RAMCO agitating platform oscillation to create Dynamic Flow Combinations. Other features include elevator platforms, platform conveyors, and a universal work carrier (not shown) all specifically engineered to maximize the effectiveness of agitation, solution turbulation, and ultrasonic energy to the working zone.